From left to right: Panelists John Annis, Martha Wells, Monica Van Buskirk, Wes Roberts (center, moderator), Carol Butera, Mark Pritchett and Series Sponsor Brian Mariash. Photo Credit: Wyatt Kostygan. 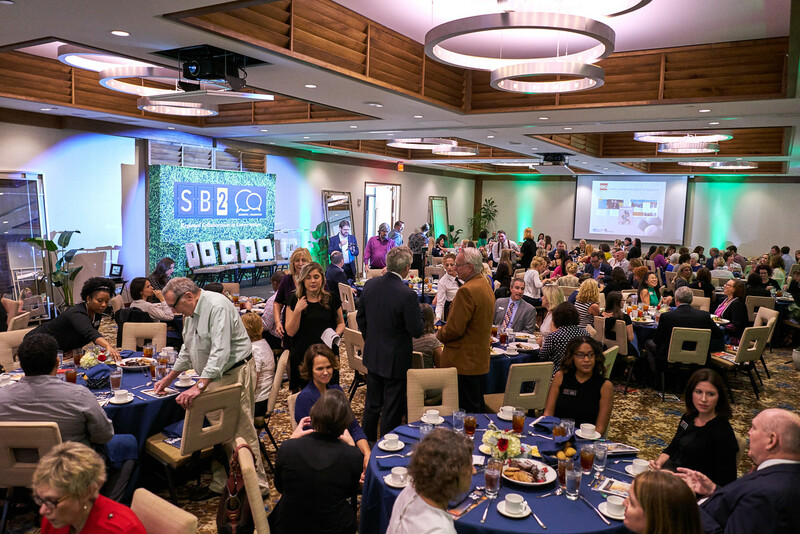 On Thursday November 30, SRQ MEDIA launched the brand new 2017-2018 SB2 Luncheon Symposia Season to a sold-out crowd and took attendees on a journey inside the minds of some of the most notable and innovative philanthropic foundations in our area at SB2 Philanthropic Agenda. Hosted at The Francis in Downtown Sarasota, the discussion centered around the recent debates in Washington D.C. on tax reform and how it could impact deductions and incentives for giving. Opening presenter, Brian Mariash from Mariash Lowther Wealth Management welcomes guests to SB2: Philanthropic Agenda. Photo Credit: Wyatt Kostygan. After opening remarks from Series Sponsor, Brian Mariash of Mariash Lowther Wealth Management, panelists took the stage eager to dive into an innovative and empowered discussion focused on the factors influencing philanthropy on the Giving Coast. Panelists hailed from a variety of organizations: Carol Butera from the William G. and Marie Selby Foundation, John Annis from the Community Foundation of Sarasota County, Mark Pritchett from the Gulf Coast Community Foundation, Martha Wells from the Southwest Florida Chapter Association of Fundraising Professionals and Monica Van Buskirk from the Van Wezel Foundation. Panelists were passionate about the importance of evoking change in the community and focused on potential tax code reforms and the future of philanthropy. From left to right: Wes Roberts (moderator), Martha Wells, John Annis, Carol Butera, Mark Pritchett and Monica Van Buskirk. Photo Credit: Wyatt Kostygan. John Annis from the Community Foundation of Sarasota County explains what philanthropy will look like in the future. Photo Credit: Wyatt Kostygan. Martha Wells, representing the Southwest Florida chapter of the Association of Fundraising Professionals, noted other changes could affect the very mission of nonprofits, particularly a change that could allow charities to engage in more overtly political activity. “Broadening that mission would make it more challenging to have confidence and make sure it (donations) gets used the way a donor intended,” she said. Martha Wells discusses donor advisement funds at the SB2: Philanthropic Agenda Luncheon. Photo Credit: Wyatt Kostygan. “When the stock market turns we will find out who are running really strong foundations because they will prevail. We will have some fall out but again if you stick to the integrity of your mission and you build those relationships, I think you will survive,” Monica Van Buskirk, President and CEO of the Van Wezel Foundation stated. Another topic of discussion was fair pay among nonprofit employees. Panelists stressed that quality work deserved quality pay from executives all the way down the chain of command. “At non-profits we have to start thinking about paying employees that we want to keep. We have nonprofits that are doing amazing work and they are paying people barely enough to survive,” John Annis stressed. “Good people need to be paid well in order to retain them,” agreed Executive Director of the William G. and Marie Selby Foundation, Carol Butera. Mark Pritchett and Monica Van Buskirk share a laugh while on the panel at SB2: Philanthropic Agenda Luncheon. Photo Credit: Wyatt Kostygan. We couldn’t have learned the incredible things from this engaging discussion without our incredible 2017-2018 series sponsors: Mariash Lowther Wealth Management and SB2 Philanthropic Agenda event sponsor, CS&L CPAs. Thank you for supporting the SB2 series, but most importantly, thank you for the ways you give back and help people in our community each and every day. Your example inspires us. Representatives from SB2: Philanthropic Agenda Event Sponsor, CS&L CPAS. Photo Credit: Wyatt Kostygan. Click here to read the article about SB2 Philanthropic Agenda in the SRQ DAILY. A gallery of images from SB2: Philanthropic Agenda is available online. The next SB2 Luncheon will take place on Thursday January, 25 2018 with SB2: State of the Economy. We will explore the link and symbiotic relationship between Entrepreneurship and Tourism on Florida’s Gulfcoast. The luncheon will culminate with presentation of the first ever SRQ Localpreneur of the Year Awards honoring area trailblazers whose initiative and business savvy are helping our region grow. For tickets and 2017-2018 annual VIP member passes, visit SRQSB2.com.